While we can be proud of the significant progress already made in Canada and Norway, this day also reminds us that much work lies ahead. Prime Minister Justin Trudeau, left, and Norway's Prime Minister Erna Solberg, right, attend the "Women's Entrepreneurship Finance Event" at the G20 Summit in Hamburg, Germany, July 8, 2017. Today we celebrate International Women's Day. I am happy to represent Norway in a country that has made gender equality a top priority. Not only does Canada have a feminist prime minister, the government has also introduced gender budgeting. While we can be proud of the significant progress already made in our countries, this day also reminds us that much work lies ahead to achieve true gender equality. Norway has a long-standing commitment to gender equality in its domestic and foreign policies. Women's rights are a key factor behind Norway's prosperous economy and living standards. In 1986, Norway's first female prime minister, Gro Harlem Brundtland, introduced gender parity in her cabinet. Since then, women have made up at least 40 per cent of all subsequent cabinets. Today, Norway's prime minister, minister of finance and minister of foreign affairs are all female. Parliament is comprised of over 40 per cent women, and all three coalition parties have female leaders. Furthermore, the leader of the Confederation of Norwegian Enterprise (NHO) is also female. In 2006, Norway also became the first country in the world to impose a gender quota of 40 per cent representation in limited public company boards. Today, women hold 35 per cent of managerial positions. However, the pay gap and under-representation of women in leadership roles continue to be a challenge. Norway has one of the world's highest rates of female participation in the labour force. In the early 1970s, it was just below 50 per cent, but today 77 per cent of women work. Equal opportunities to work are realized through generous, affordable childcare policies and parental leave that allow both parents to have a career. These initiatives are an integral part of the Norwegian welfare system's goal of equal opportunities for all citizens. Other factors such as free education, free public health care, reintegration into the workforce and regular working hours further support women's empowerment and participation regardless of socioeconomic status. Of the up to 59 weeks of paid parental leave, 10 are reserved for the father, soon to be expanded to 14 weeks, and these are non-transferrable. This policy has been a great success as 70 per cent of fathers take the full quota or more. Men's increased participation in family life has narrowed the gender gap in unpaid domestic work, with a simultaneous increase in leisure time for both genders. When both parents are at work, the need for day care for children also increases. Over 90 per cent of all Norwegian children between one and five are currently in day care. Full coverage for children in this age range is now secured by law. Both public and private day cares have a maximum costof six per cent of the family's income, and an absolute monthly price cap equivalent of CA$460. Single parents receive additional funding. These welfare schemes are costly, but they are an investment that pays off. Women's participation in the labour force has contributed tremendously to Norway's growth and welfare. According to some reports, it has actually contributed more to our GDP than the oil from the North Sea. Despite progress in many areas, challenges remain. The number of women in part-time jobs is still a challenge and many women from ethnic minorities are not in paid employment. Sexual harassment of women and violence against women continue to be an issue of concern. The Sustainable Development Goals have energized the work for gender equality. We are seeing results at the global level. In health care and education, the gap is closing. However, there is still a huge gap between women and men in terms of economic participation and rights, and in terms of political empowerment. This is why Norway has made girls' education one of five top priorities in our foreign and development policy in 2016-2020. A total equivalent of CA$580 million is allocatedto global education in 2018, and Norway announced earlier this year a contribution equivalent of CA$330 million to the Global Partnership for Education over the next three years. In 100 countries, women face gender-based job restrictions. In 46 countries, there are no laws to protect women from domestic violence. In 16 countries, men can legally prevent their wives from working. These are examples on how concrete barriers, based on social norms, are hindering women's participation. The sad fact is that countries that deny women their rights are preventing their societies from prospering. Equal rights and equal participation have their own inherent value, but they also benefit society as a whole. They are drivers of economic growth and development. A modern, competitive economy needs simply the best heads and hands, regardless of gender. 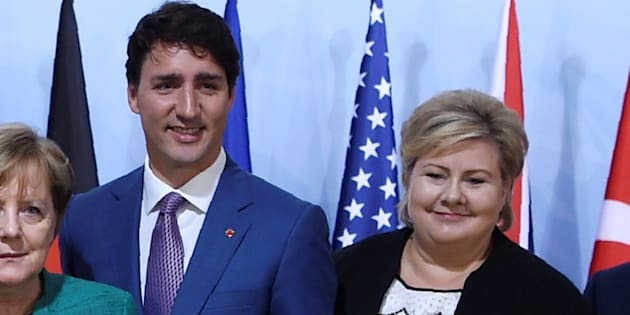 Norway is therefore working together with Canada and other partners to reach the goals and targets on gender equality and women's empowerment.